Pulitzer Prize–winning author Annie Proulx brings the immigrant experience to life in this stunning novel that traces the ownership of a simple green accordion. E. Annie Proulx’s Accordion Crimes is a masterpiece of storytelling that spans a century and a continent. Proulx brings the immigrant experience in America to life through the eyes of the descendants of Mexicans, Poles, Africans, Irish-Scots, Franco-Canadians and many others, all linked by their successive ownership of a simple green accordion. The music they make is their last link with the past—voice for their fantasies, sorrows and exuberance. 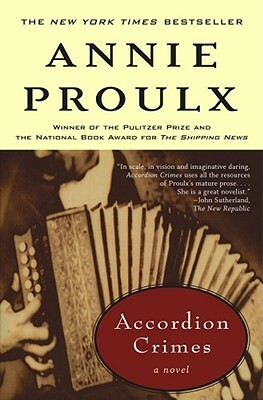 Proulx’s prodigious knowledge, unforgettable characters and radiant language make Accordion Crimes a stunning novel, exhilarating in its scope and originality. John Sutherland The New Republic In scale, in vision and in imaginative darling, Accordion Crimes uses all the range and the resources of Proulx's mature prose....She is a great novelist. Michael Dirda The Washington Post Book World You would think Proulx would have the simple decency to make her third novel merely so-so, if only to let someone else grab a little limelight. No such luck...She now seems to know everything about writing. And a fair amount about life, too. Phoebe-Lou Adams Atlantic Monthly Splendid...Ms. Proulx is a magician. Gail Caldwell Boston Sunday Globe A daringly intelligent work with a soul as wide as the Mississippi. Kathleen Byrne Globe and Mail Review of Books Crisp and authoritative, her spare, dense prose is mesmerizing ...A majestic novel.